Is it a flying saucer? It is a car? Well, it is actually both. You either like it when people stare at you and shake their head, or you don’t. Steve Anderson likes it. “Watch,” Anderson said. He pulled into the Speedway gas station at 56th and Emerson. 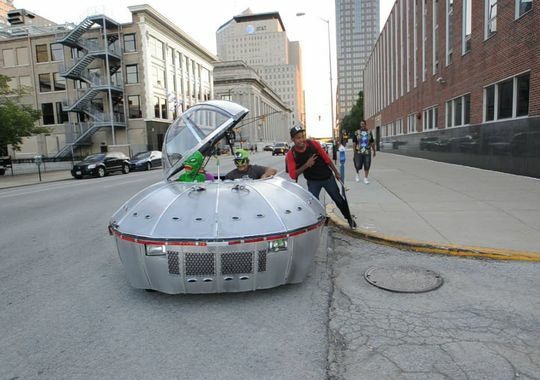 He was driving a thing that technically was a car — it had four wheels and a license plate — but looked more like a flying saucer out of a 1950s science-fiction movie. It was 1 p.m. on Thursday. Not one other car was at the gas station. But within four minutes, eight cars pulled up, the drivers not interested in gas but the spaceship. Anderson lifted the glass canopy to give people a better look at the small but unique interior. Seats covered in shiny, blue vinyl. A steering wheel cut down to resemble an airplane’s yoke. The mostly aluminum rig sits on the chassis of a 1991 Geo Metro, a subcompact. Cellphone cameras came out. “Man, that’s cool!” “My wife’s not going to believe this!” “That thing street legal?” (It is.) In the cockpit, Anderson wore giant sunglasses made of bright green plastic. “Nanu, nanu,” he said. Anderson is 58, has longish gray hair and looks a lot like Jimmy “The Greek” Snyder, the bookmaker who in the 1970s and ’80s was a sports commentator on CBS’ “The NFL Today” show. He is 5 feet 8, weighs 195 pounds and stands with his hands on his hips. He carries a .38 Special in a holster on his belt. Someone in the movie business once suggested to Anderson that he’d make for good reality TV, where people less memorable than him have become stars. There’s more to him than his spaceship, too. Anderson is layered. He operates a garage at 56th Street and Keystone Avenue called A OK Car Care. In the 1980s and ’90s he operated A OK Karate. He once had six dojos in Indianapolis but closed the last of them in 2003. (By 2010 even archery’s popularity had surpassed that of karate). In Anderson’s auto shop are photos of him in his youth wearing a mustache and performing karate moves. In one he is standing with Chuck Norris, the martial-arts celebrity. Anderson has chased celebrity down several avenues. He pursued making an appearance on Norris’ hit TV show “Walker, Texas Ranger.” He tried out for a TV commercial for appliance retailer hhgregg and also for a part in a motion picture filmed in Franklin called “Gila,” about an oversized Gila monster. As a kid in the 1960s Anderson watched B movies about outer space, and a year ago he envisioned the spaceship car. He hired his friend Dennis Bellows to make his dream a reality. Bellows had done Anderson’s bidding previously by installing a 350-cubic-inch Chevrolet motor in what looked like a stage coach. “Steve basically says, ‘I want a covered wagon,’ or ‘I want a spaceship,’ and I go from there,” said Bellows, a diesel mechanic who builds custom cars in his spare time. Since taking delivery in June, Anderson and his girlfriend, Debbie Livingston, have spent their weekends crisscrossing Indiana, entering dozens of car shows and “cruise-ins,” which are informal car shows. “We’ve been getting a lot of People’s Choice awards,” Livingston said. Last weekend the two drove the spaceship to Huntington for the 27th annual Kroozinationals. There was no money in this or in any of the car shows. The car owners compete only for trophies.